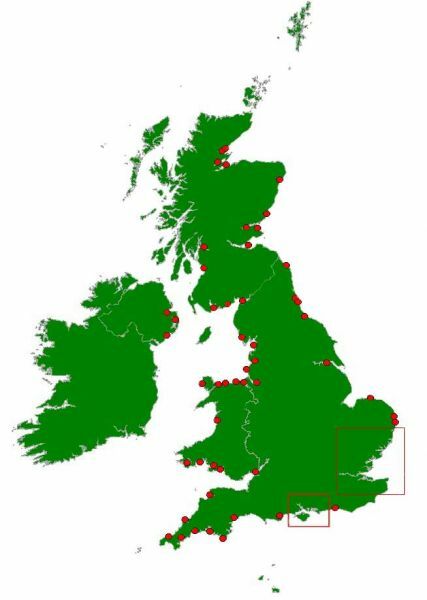 Click on the site of interest to find out the level of coverage attained by the WeBS Low Tide Count scheme. Note that the Solent and Thames areas each contain a number of adjacent sites and are displayed in more detail by clicking on the relevant boxes. If you are not sure of the location of the site you're interested in, please search in the alphabetical list of sites. Inteactive section maps are not yet available for Low Tide sites. Please lowtide [at] bto.org (get in touch) if you require a jpeg or GIS shapefiles of the count sections of a particular estuary. The counts run from November to February of a winter - the months listed are those for which any counts were received. The level of coverage is described broadly as "good" (for relatively complete geographical coverage of a site) or "partial" (where counts only refer to restricted sections of a site). Note that the coverage information is updated to the end of the 2008-2009 winter. WeBS is a partnership between the British Trust for Ornithology, the Royal Society for the Protection of Birds and the Joint Nature Conservation Committee (the last on behalf of the statutory nature conservation bodies: Natural England, Natural Resources Wales and Scottish Natural Heritage and the Department of Agriculture, Environment and Rural Affairs, Northern Ireland) in association with the Wildfowl and Wetlands Trust. Email: webs [at] bto.org.